Nathan Law Kwun-chung, a 23-year-old student leader from Hong Kong who burst onto the scene in 2014 as one of five student leaders who led popular protests against Chinese rule of the island has bagged 50818 votes to earn himself a seat on the legislature. 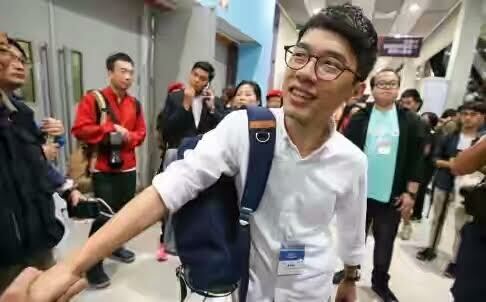 The electoral victory makes him the youngest ever elected member of the legislative council. Law said: “It can be described as a miracle that I won. It was out of my imagination that I won with more than 50,000 votes. The [large number of] votes will remind me to do better and not to let people down in the next four years.” His political ascension is not what he has always had in mind as he saw politics as a dirty game. The reserved and soft-spoken student leader told the Post in June he had never thought of entering politics when he was younger, as he considered it “a dirty game with people fighting among one another for self-interest”. In April, Law and others founded Demosisto, with Joshua Wong Chi-fung who led the now-disbanded student group, Scholarism. They pledged to work for the city’s “self-determination”. In its manifesto, the party stated it would hold a referendum in 10 years to let Hongkongers decide their own fate beyond 2047, when the principle of “one country, two systems” officially expires, and would adopt non-violent protest tactics. Law who was born in 1993 moved to Hong Kong from mainland China with his mother in order to reunite with his father. An avid video gamer, Law became an e-sports commentator in 2012 and used to host a live online gaming show.